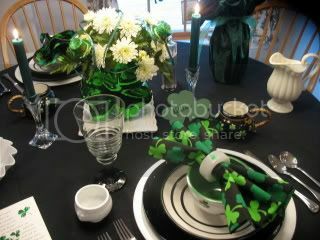 I used a black cloth to pick up the colors of the black and green napkins.. 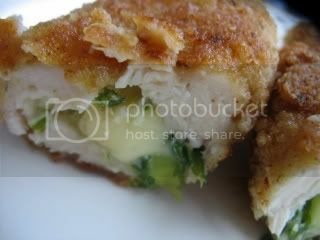 The prayer of St. Patrick..
My version of Chicken Kiev.. 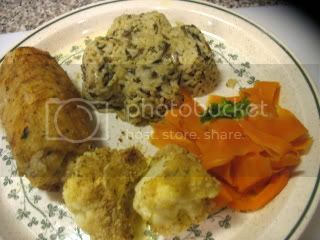 Served with a shamrock of wild rice, cauliflower and carrots.. Thanks so much for coming..
And see you for Foodie Friday.. Please join me for the party here on the 17th,,decorations or food to celebrate St. Patrick's Day...Mr. Linky will be up the night before.. I LOVE this tablescape. The green and white against the black...is just elegant beyond words. Beautiful! Oh, Kathleen, this just took my breath away. The black background is so perfect--the green seems to vibrate. Your chicken.....I called Young Bandwith over to take a peek. We are making this ASAP. I can't wait for your St. Patrick's Day party. The celebration of Irish food has been such a delight. I forgot to say that the shamrock rice mold is genius. Oh this is fabulous the tablescape and the menu!! I love it all. Gorgeous table setting! The food looks delicious too. 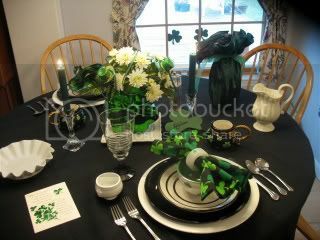 What a pretty St. Pat's tablescape! Your food looks great too! Perfection once again! I can't wait to see your tablesetting for the party! The black tablecloth just makes all the greens pop. 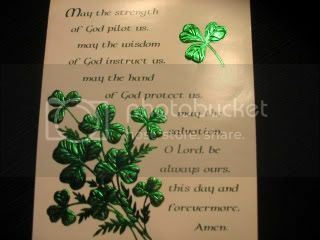 I love St. Patrick's prayer too. Chicken Kerry looks so good! Is Kerry a brand name or a type of swiss? The molded rice makes me smile...Perfection from beginning to end. The chicken looks really good! So does the rest of the menu! I liked the black tablecloth. I never would have thought to use it but it looked perfect here and was a nice surprise. I love your centerpiece and the food sounds wonderfully delicious!!! You're certainly ready for St. Patty's Day. Your tablescape is lovely and the food looks delicious. Oh, Kathleen, how pretty! I love the use of your black tablecloth! The green and white just pop! 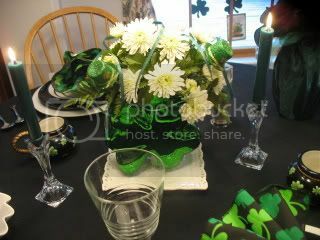 Festive table and who needs a pot of gold when you serve up that delicious food. Wow! I was laughing to myself because of your black tablecloth (that looks gorgeous) we will probably see more posts in the future with black. Your table just looks great and that food looks scrumptious. what wonderful pictures...I love it! Pretty Table! Pretty Food! Does it get any better? What an elegant table! I shouldn't be looking at this great food while I'm hungry and it's too late to cook! Kathleen, the black tablecloth is a nice back drop for the dishes. A very clever shamrock rice mold! You do know that I am jotting down all your ideas in case I feel the desire to do an dinner party next March! We have a similar chicken dish and love it. Great post, and I can't wait until your party on the 17th. That black cloth just sets everything off perfectly. Love the shamrock mold for the rice. I love the black, white and green together, Kathleen. Everything looks so nice! The black mugs with green shamrocks are adorable. Your Chicken Kiev, oops, Kerry, looks so delicious! You always make every meal look special with your extra touches. Your table is gorgeous and the chicken looks delicious!! What an elegant Irish table! Your menu is mouthwatering! Just an unbelievably beatiful table! Thanks for sharing this great setup. I'll definitely have to try it soon! The food looks luscious, and the tablescape is beautiful. I like the idea of the black -- wouldn't have thought of it -- That's why these events are fun. we see things to trigger our own creativity. When I first heard black tablecloth I thought..Oh No! But it really worked well, can't imagine any other after I've seen it! 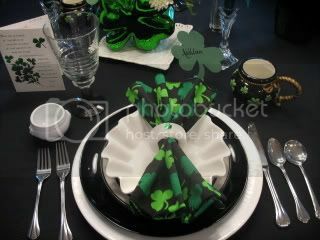 Love all the shamrock bowls, plates...can't wait to see your decorations next Tuesday! Th chicken Kelly looks yummy..now did you make up that disn and name? Loved this, just loved it! I love the black, white, and green...perfect color combination to make the green POP! Loved the food disply...you're killing me with the shamrock design for the rice. This is just awesome. I'm going back to take another peek! Green and white against a black background -- perfect! Your table is wonderful, and that chicken looks DELISH! I love the Chicken Kerry ..The photo of the large platter of it is fabulous. And how cute is your shamrock rice. 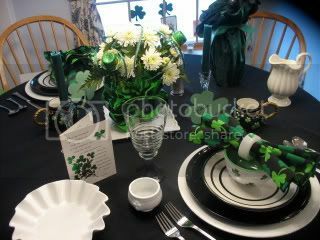 Kathleen, your black/white/green tablescape is really quite stunning. 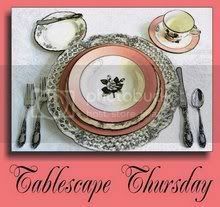 You do have the best tablescapes! The chicken with Kerry Swiss sounds and looks delicious. Ok, one of my favs so far this week. Love the black, white and green combo. And Oooo the food, wow that looks good! Kathleen, Love this tablesetting! And dinner looks grand. 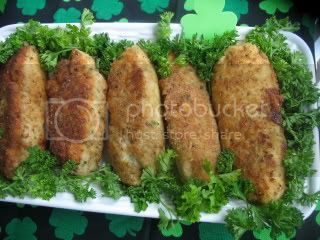 Great idea with the shamrock rice. I love the black with the white & green. And the food!!!!! I love the shamrock rice idea. Great tablescape. Beautifully done. I love the green and white with all the black. Scrumotios, simply scrumptious! I hope I can remember to link next week for yoru st pats linky. The black really show off the great wearing of the green. I am sure all the lepechans will be at house for dinner. Just beautiful. The black is so different and perfect. A great look to set off the green and white. Scrumptious dinner > as always. 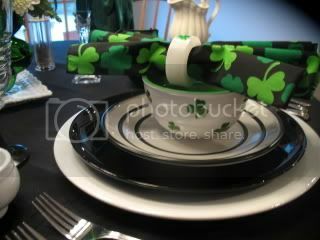 what a great idea to use the drama of the black with your St.Paddy's Day tablescape. It looks GREAT!!! And as always I'll be leaving your blog in search of food in my kitchen. Kathleen, I love your table! The black really sets off the green. I love the molded rice. I am going to have to do that next year! Can't wait for your party! I'll be back. The black table cloth is very effective! Your food looks wonderful may I come to your house for dinner? Is the Kerry Chicken baked, fried or a combination of the two? Having a St. Pat's dinner party and this sounds lovely!